What a wonder and how amazing it is to embrace true diversity; from ethnic background to gender; age; language; ability/disability to country of origin. Doing so unleashes tremendous creativity; innovation and alternative ways of changing the world based on the diverse lived experiences of people. This requires inclusion at all levels of organizations and communities. However, we are surrounded by educational, judicial, religious and governmental institutions having a history of the opposite; exclusion and oppression. These are often based on the limiting sentiments, dogma and psychological oppression as expressed in Shrii P.R. Sarkar’s Neohumanism: the Liberation of Intellect. We cannot help but be affected by these institutions ourselves, unless we understand how these systems work. Our social liberation is intimately bound with that of the oppressed. This work requires deep reflection and analysis of our own lived experience and is aided by the work of Professional Diversity Facilitators. Neohumanists and Proutists are a very diverse group of people in every way, shape and form; but we have a long way to become truly inclusive of those diversities both within and outside our organizations. This was the mission that created a program on diversity at a Conference on Neohumanism/Prout and Spirituality during the summer of 2017. The title of the program was “Unleashing Diversity: an Inside-out Approach to Neohumanism”. In the afternoons, we formed a Diversity Working Team to further explore diversity issues in our lives and in our organizations. There was a pervasive passion to create a more inclusive and diverse Neohumanist and Prout organization. Since that Conference our group has met to develop recommendations; policies and strategies to move towards that goal. I have to thank Anita Harshman and Richard Maxwell who assisted me at every step in the process. The initial workshop and afternoon trainings reflected some of the basic building blocks of this training. However, I recommend those interested in experiencing their own training to find a professional organization that facilitates diversity processes. Often, they are under the banner of “Anti-Racism” or “Anti-Oppression” Training. The first step in diversity training is to begin to see life from the eyes of others. We engaged in an exercise called “The Privilege Walk.” (https://www.youtube.com/watch?v=hD5f8GuNuGQ). The idea was to find out who among us experienced greater privilege or opportunity in our lives and who experienced less opportunity and privilege. We formed a large circle of all participants, then asked them to take a step forward or backward, based on their answers to several questions. One question was whether they experienced more opportunities or fewer opportunities based on their gender. Many women stepped backward, indicating that they had experienced fewer opportunities; while many men stepped forward. An ensuing question was whether they experienced greater or fewer job opportunities because of the color of their skin; age; identity or language background. Another question was whether they felt their ethnicity was represented in school textbooks. After the exercise, we all looked around the room; noticing the wide spread amongst us; indicating a wide range of privilege or opportunity or lack of privilege or opportunity. It was obvious that we needed to learn much more about the lived experience of our participants in order to begin the process of real change. Next, we reviewed a proposal for a definition of diversity from a group promoting anti-racism training. 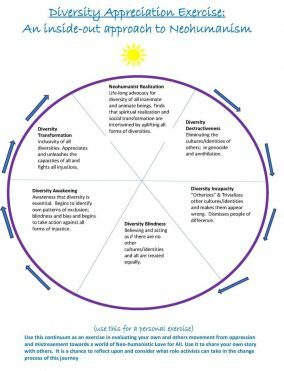 A second goal of diversity training is to understand how racism become habituated and then institutionalized. We viewed a film of a large audience of people (https://www.youtube.com/watch?v=5NHeFgaVWs8), where they were segregated based on either blue or brown eye color. The blue colored people were treated by the facilitators as being ignorant; uneducated and “factually” proven to be inferior. A tension arose in the room as brown-eyed participants reinforced this stigma; giving their own examples and started to stereotype those with blue eyes. The blue-eyed students were angry; defiant and resented the brown-eyed participants. Participants discussed how superficial differences easily become institutionalized and embedded in our psychology. We reviewed how this occurred in our own history and understood that in fighting oppression, institutionalized racism was a huge barrier. We discussed whether there was any basis for biological differences between people. The obvious physical changes have no association with mental or physical ability – they are a relatively recent (30,000 years ago) phenomenon based on the impact of varying climates. They have been an excuse for slavery; genocide and all forms of exclusion and oppression. I then presented ways that our own liberation is bound up with others. The first way is to recognize that other oppressed groups have had to face their own oppression; with many ethnic groups facing annihilation unless they stood up. They were able to name and understand these systems of oppression and then rise up for their own liberation. Often, when we experience a privileged life; we cannot see these systems of oppression that surround us so clearly. We have to look to these oppressed people to lead our own process of liberation. A second way to bond with the oppressed; is that many groups; after processing their oppression realize that the only lasting solution is to build their own autonomy and self-reliance. An example was given of a Mayan network of communities that has revived their spirituality, culture and language. They have developed a network of agricultural and women’s’ cooperatives, as well as arts and medical cooperatives and are involved in reforestation. They understand a Neohumanist and Proutist future. White or other Privilege: Realizing that European heritage people have automatic advantages over others. Cultural Blindness: Realizing that we may not see the true differences in people or the oppression and discrimination that occurs all around us. Gender bias: Realizing that we and/or society has treated others differently because of their gender or gender identity. Educational Conditioning: Realizing the US Education System has treated history as the story of the dominant culture; leaving out the history of indigenous peoples; black and Hispanic peoples and other identities. The above presentations; dialogues and experiential exercises enhanced our ability to dialogue about the following diversity issues in our own organizations. How are we already diverse. . . what are our strengths? How can we become highly inclusive of all diversities? How can our organization infuse diversity at all levels? How can we assure all diversities that they are safe; honored and encouraged to soar? 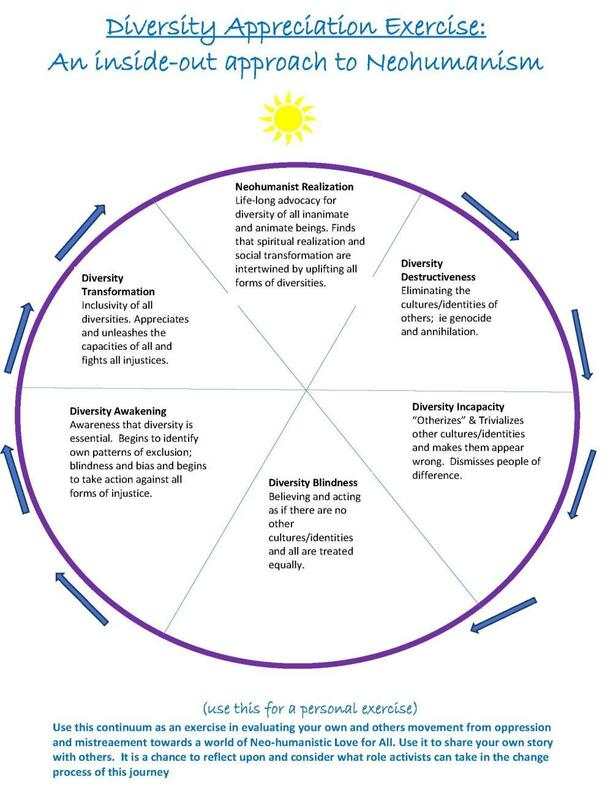 How can we develop affinities with all diversities? Presentations from small group dialogues of the above questions emphasized an extreme gender inequality experienced over many decades. Other groups expressed the need to have true diversity in the leadership of our organizations, and to work in unity with diverse organizations in our communities. In order to achieve a greater depth of understanding of diversity and to develop action steps to take, there were two further workshops. A subsequent essential element of most diversity training is for all participants to share their life stories. It is designed for individuals and organizations to start with an “inside-out approach” to moving from harmful perceptions and actions to liberating actions. An example was given of how through the lived experience of the one person, they moved from cultural isolation and privilege, to beginning to understand the exclusion and bias that the dominant society places on diverse peoples and a lifelong mission of transforming bias and uplifting diversity. 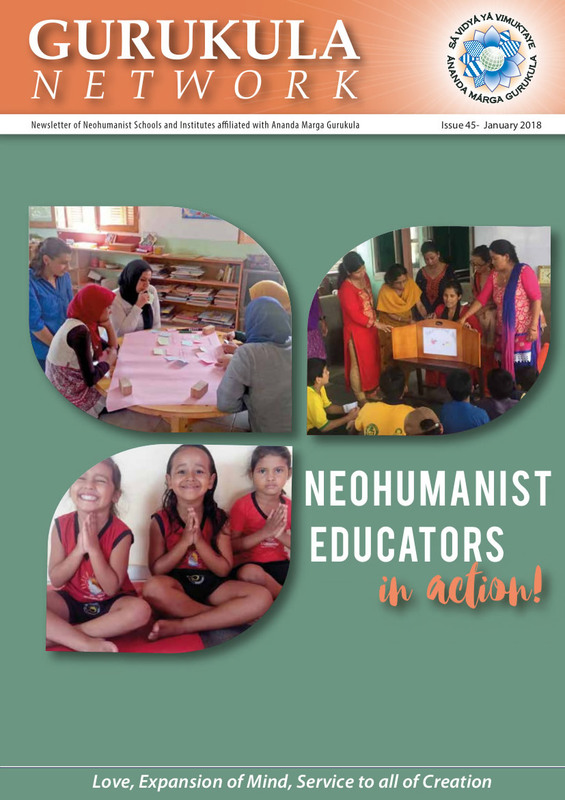 Participants shared their own stories with one another, realizing that their own personal path was both a rigorous challenge to their own life experience and an inspiration for a rigorous life in becoming truly neohumanist. This presentation was given by Richard Maxwell, based on the book: “The New Jim Crow” by Michelle Anderson. With detailed research, personal stories and documentation, the author proves that the current situation for blacks, especially black males is very much the same as the “Jim Crow” South (mentioned earlier in this essay) in which black people were treated with violence; lacked educational opportunity, and were oppressed and excluded by every institution surrounding them. Her thesis is that the Jim Crow that exists today is a product of the criminal justice system. Color-blindness in this situation means that people are blind to the ways that blacks are mistreated. Once convicted of a felony and they leave prison, they are excluded from social supports and services (low income housing, food stamps, employment opportunities and the right to vote). While one in three blacks face imprisonment in their lifetime, for white men the rate is one in seventeen. Police target poor neighborhoods and people of color for drug offenses that are largely ignored in other areas. The judicial system has been shown to be biased against defendants of color in plea bargaining, jury selection and sentencing. The prison system and corporations that contract with it, benefit financially from cheap labor. All participants agreed that the focus on diversity issues in Neohumanist and Prout organizations and in conferences is important and very motivating. Therefore, our primary action item is to continue the effort to address diversity through forming a diversity working group. Important ideas and issues include having language/cultural exchanges at conferences, creating opportunities for deeper sharing of personal and cultural experiences, encouraging collaboration with diverse communities, finding ways to build capacity and eliminate barriers for diverse leadership and making involvement accessible for all. Another important focus was to identify the barriers and initiatives that would bring more gender equality.